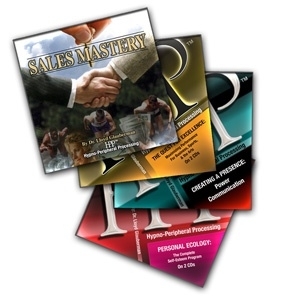 "Dr. Glauberman�s, Quest For Excellence, Creating a Presence, Sales Mastery and Personal Ecology are by far the best hypnotic tools for someone serious about integrating sales and persuasion skills. These HPP Programs let my techniques settle DEEP into my students� minds, creating positive unconscious behaviors and results!" HPP programs lead users into the theta state of consciousness, the "twilight state" between waking and sleeping, where their ability to generate positive emotional shifts quickly is greatly enhanced. The programs are entertaining, easy-to-use and will help you achieve your goals. Get the Power & Persuasion Super Pack and learn to utilize your own unique abilities to listen, influence, compete and close!